The all new BES knife boxes are finally here! Bushwood Equipment Sales have designed and developed a new knife box that has a handle to make carrying heavy blades safer and more efficient as well as a greater lifespan due to the use of a high grade PPUV stable plastic that also protects it from the harsh Australian sun. 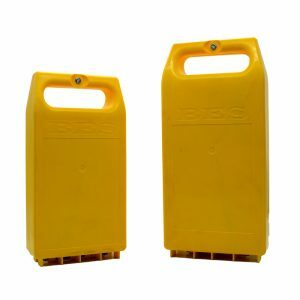 Not only does it minimise risk but it also allows users to carry two boxes at once, with up to 8 big blades or 16 small blades across the two boxes. The box lid is tightened by hand using a wing nut and bolt to ensure the user is in control of securing the box safely.